Smoke Fifty-One Duo has earned 2 STARS and is NOT RECOMMENDED. We appreciate the efforts that businesses make in order to offer basic starter kits which contain the minimum essentials for trying out their products without making a massive and blind investment. However, we also expect such kits to sell for a reasonable price. The Smoke 51 Duo Express Starter Kit does not meet this expectation. Prior to applying discounts, this kit sells for $79.95 plus shipping charges. We paid the price and did not get much in return. 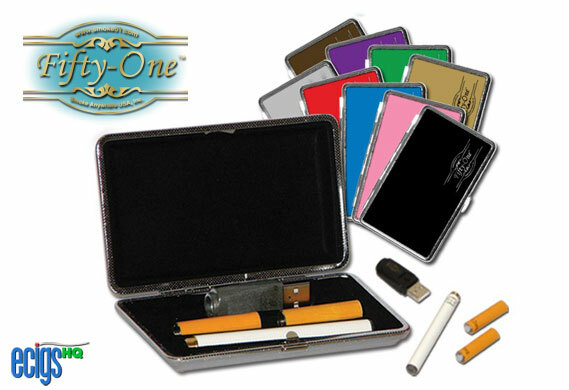 While this kit does include a metal carrying case, it only comes in a choice of five colors rather than the nine suggested by the photo. Inside the carrying case is the remainder of the purchase: one lithium-ion battery, two 6mg Tobacco flavor cartridge/atomizers and one USB charger. There is no choice of nicotine strength or flavor. It hardly needs to be said that our opinion at Top 5 Electronic Cigarettes is that we paid a sky-high price for an inadequately equipped kit. Smoke 51 should remember that they are trying to draw in long-term customers with these kits rather than trying to rake in huge profits up front. The worst thing about the taste is how long it takes to get it out of your mouth and nostrils. We do feel the obligation to admit that Smoke 51 Duo replacement cartridge/atomizers actually sell for decently moderate prices and offer some selection in regard to flavor and nicotine strength. They have Tobacco and Menthol flavors which range in nicotine strengths from 0mg to 16mg. They also offer discounts for large purchases. In addition, the high price of their starter kit has little effect on annual savings when you use this product. You can increase these savings significantly by subscribing to their Club 51 Refill Filter Program. The Express Starter Kit was simple to use and it was only moments after opening the package when we were able to attach one of the cartridge/atomizers to the battery and begin smoking. The excellent plume of vapor which we exhaled was, unfortunately, the best thing about the product. Taste is subjective but there are some tastes which almost everyone detests. Add Smoke 51 Duo to the list of hated flavors. There may be some people out there that would appreciate the Smoke 51 Duo but we did not find them during our test. Besides the five judges, we actually extended an invitation to four other smokers to try this brand. None of them had a single good thing to say about it. Some of the things that they said are not printable for this publication. The worse thing about the taste is how long it takes to get it out of your mouth and nostrils. We considered the possibility that we had received a bad batch of cartridge/atomizers. However, we were so upset by the experience that we were reluctant to try it again. For $79.95, the Smoke 51 Duo Express Starter Kit is a below-average value. Even after applying discounts, this negative description applies. To make matters worse, they charge for shipping and do not provide any kind of money-back guarantee. There is, however, a Limited Lifetime Warranty with all Smoke 51 Duo products. Maintaining a pack-a-day habit with Smoke 51 Duo products would cost $646.45 per year. We base this calculation on bulk orders of cartridge/atomizers. This is one of the least expensive electronic cigarettes available. Compare this cost to the cost of maintaining the same habit using tobacco cigarettes. At $6 per pack, you would pay $2,190 per year. Switching to Smoke 51 Duo would save you $1,270.55. This does not include in consideration all the health benefits of using an electronic cigarette. First click the Smoke Fifty-One website link below. To receive 10% off your Smoke Fifty-One order, enter DSC-5765 in the Coupon Code box at checkout.